Since 2009, Intertrust Ireland has grown from one employee to over 90 and now has a focus on new recruitment within the Irish employment market to support its projected growth over the coming years. Intertrust is a global leader in providing expert administrative services to clients operating and investing in the international business environment. Dublin is a key financial centre and Intertrust Ireland has built a strong offering over the decade it has been operational. 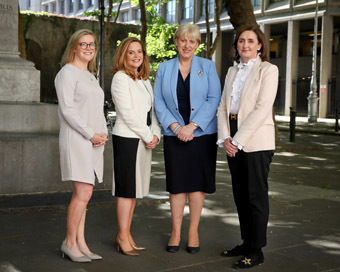 Pictured (l-r): Fiona McCabe International Financial Services Project Manager IDA, Anne Flood, Head of Capital Markets Intertrust Ireland, Minister for Business, Enterprise & Innovation, Heather Humphreys TD and Imelda Shine, Managing Director Intertrust Ireland.